Kuan Yin is revered in Buddhism as the compassionate Saviouress, the Bodhisattva of Mercy. 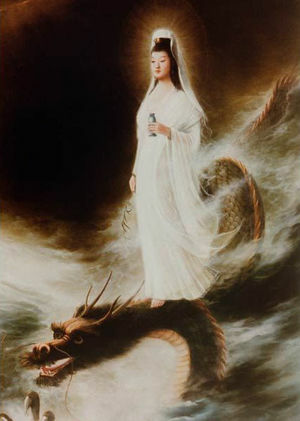 Beloved as a mother figure and divine mediatrix who is close to the daily affairs of her devotees, Kuan Yin’s role as Buddhist Madonna has been compared to that of Mary the mother of Jesus in the West. Throughout the Far East, devotees seek her guidance and succor in every area of life. Altars dedicated to Kuan Yin can be found in temples, homes and wayside grottoes. The name Kuan Shih Yin, as she is often called, means “the one who regards, looks on, or hears the sounds of the world.” According to legend, Kuan Yin was about to enter heaven but paused on the threshold as the cries of the world reached her ears. Kuan Yin is revered as protectress of women, sailors, merchants, craftsmen, those under criminal prosecution and those desiring progeny. There is an implicit trust in Kuan Yin’s saving grace and healing powers. Many believe that even the simple recitation of her name will bring her instantly to the scene. Kuan Yin’s Crystal Rosary contains her mantras and is a powerful means of invoking her intercession. For centuries, Kuan Yin has epitomized the great ideal of Mahayana Buddhism in her role as bodhisattva—literally “a being of bodhi, or enlightenment,” who is destined to become a Buddha but has foregone the bliss of nirvana with a vow to save all children of God. Kuan Yin has taken the bodhisattva vow to work with the evolutions of this planet and this solar system to show them the way of the teachings of the ascended masters. According to legend, Avalokitesvara was born from a ray of white light that Amitabha, the Buddha of Boundless Light, emitted from his right eye as he was lost in ecstasy. 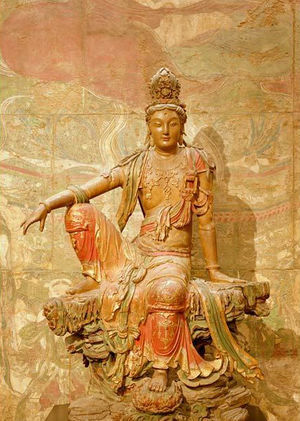 Thus Avalokitesvara, or Kuan Yin, is regarded as the “reflex” of Amitabha—a further emanation or embodiment of maha karuna (great compassion), the quality that Amitabha embodies. Devotees believe that Kuan Yin, as the merciful redemptress, expresses Amitabha’s compassion in a more direct and personal way and that prayers to her are answered more quickly. 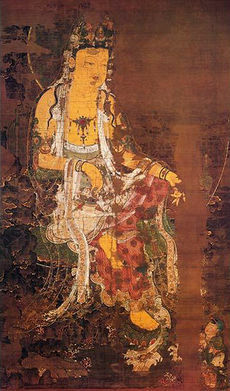 In Buddhist tradition, Kuan Yin is sometimes depicted as the captain of the “Bark of Salvation,” ferrying souls across the rough sea of their karma to Amitabha’s Western Paradise, or Pure Land, the land of bliss where souls may be reborn to receive continued instruction toward the goal of enlightenment and perfection. It is widely believed that Kuan Yin took embodiment as the third daughter of Miao Chuang Wang, identified with the Chou dynasty, a ruler of a northern Chinese kingdom about 700 B.C. According to legend, she was determined to devote herself to a religious life. She refused to be married despite the command of her father and the entreaties of her friends. Finally, however, she was permitted to enter the Nunnery of the White Bird in Lungshu Hsien. Here, at her father’s orders, she was put to the most demeaning tasks, which in no way dampened her zealous love for God. Angered by her devotion, her father ordered her to be executed, but when the sword touched her, it broke into a thousand pieces. Her father then commanded her to be stifled, but when her soul left her body and descended into hell, she transformed it into paradise. Carried on a lotus flower to the island of P’ootoo, near Nimpo, she lived for nine years healing the diseased and saving mariners from shipwreck. It is said that once, when word was brought to her that her father had fallen ill, she cut the flesh from her arms and used it as a medicine that saved his life. 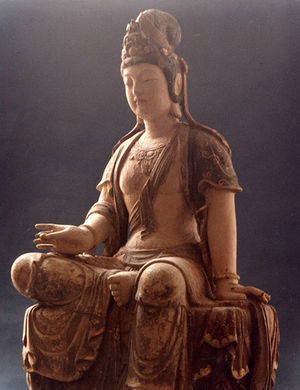 In gratitude, he ordered that a statue be erected in her honor, commissioning the artist to depict her with “completely formed arms and eyes.” The artist misunderstood, however, and to this day Kuan Yin is sometimes shown with a “thousand arms and a thousand eyes,” thereby able to see and assist the masses of her people. ... mercy is the quality of love that smoothens the rough places of life, that heals the sores of the etheric body, that mends the cleavages of mind and feelings, that clears away the debris of sin and the sense of struggle before these manifest in the physical body as disease, decay, disintegration and death. Kuan Yin reminds us, “When you feel the need of greater strength, of illumination, of greater purity and healing, remember that all of these qualities come to you from the heart of God by the power of the flame of mercy itself. For in forgiveness there comes renewed opportunity to fulfill the Law, and without forgiveness little progress can be made.” Therefore, in order to reenter the walk with God, we need forgiveness. When we invoke it, let us realize that our own Christ Self is our psychiatrist, our psychologist, our minister, our priest, our rabbi, our friend, the one to whom we should go daily to unburden ourselves, as the American Indians did. They made a circle around the camp fire at night and discussed the events of the day. And all that they didn’t like, they threw into the flames. It is the same principle that has been taught in every religion of the world. When we put it into the flame, we can go to bed at night in peace. Much insomnia is caused because we are not releasing our daily karma, our daily burdens; and therefore, we are not at peace with ourselves and with God. We have a need for confession, a need to tell God what we have done that is not in keeping with his Law. Until we tell him about it and ask for his flame of forgiveness to pass through us, we have that sense of guilt, fear, shame, and above all a separation from him. Today this is manifest in all kinds of mental and emotional diseases, split personalities, hatred of father and mother, hatred of children, and many other problems to which modern society has fallen prey. The path back to the guru, the Inner Christ, is calling upon the law of forgiveness. When we invoke the law of forgiveness, it bursts like fireworks in the aura as violet, purple and pink, dissolving unpleasant conditions in our world. And it begins to intensify until great spheres of energy are going forth from our heart and inundating the world. You may visualize a loved one, a child, a self-styled enemy, a political figure; you may visualize an entire city, the government, the whole nation or the planet within this brilliant sphere of mercy’s flame, becoming the recipient of waves and waves of this wine of forgiveness. There is a difference between the forgiveness of sins and their transmutation. Someone may steal your purse and later tell you that he is sorry he took it. You may forgive him, but the matter is not closed, karmically speaking, until he returns that purse to you with every penny intact or makes whatever restitution is necessary. Forgiveness is not the balancing of karma; it is the setting aside of karma whereby you are given the freedom to make things right without that heavy burden of sin. The mercy of the law is like a two-way street. It is the signal that you send to God and the signal that he returns. A two-way street means the give-and-take with God. If you expect mercy from God, then you must give mercy to every part of life. The fulfillment of the law of mercy must be for the ultimate liberation of each and every soul. Thus, as we forgive life, life forgives us. With wings of cosmic victory. I flood forth forgiving grace. As you give this prayer daily, you may wish to visualize the flames of mercy, which are a lovely pink-violet color, enfolding your being and removing the cause and core of many wrongs of the past. It is possible to experience a great sense of relief from burdens you may have been carrying for centuries as you call for forgiveness for your sins—even those of which you may not be aware in this embodiment—and then truly accept God’s grace and forgiveness that he is extending to you through the gift of his violet transmuting flame. The color violet has many hues ranging from the orchid-pink of mercy’s flame, containing a greater saturation of the pink ray of God’s love, to the deep-purple flame that embodies more of the blue of the will of God. The purple flame has a greater electronic cleansing action, which, when used alternately with the healing green decrees, will effectively purify and heal the four lower bodies, especially the etheric body (the memory body) of the records of the past that may be buried deep within the subconscious. To invoke this flame, take any violet-flame decree and substitute the word “purple” for “violet.” Oftentimes it is more difficult to penetrate to the etheric body than to any of the other lower bodies, and therefore the repetition of a mantra thirty-six times can be very effective in clearing old records of past momentums. For many of you I have pleaded before the Lords of Karma for the opportunity to embody, to be whole, to not have dealt to you in the physical the great karma of being maimed and blinded at birth that some of you have deserved. I have interceded with the flame of mercy on your behalf so that you could pursue, in the freedom of a sound mind and body, the light of the Law. Some who have been denied that mercy by the Lords of Karma are today in the institutions for the insane; for them it was meted that they should experience the agony of the absence of the presence of the Christ mind, that they might know what it is to defile that mind, that they might return in another life and appreciate the gift of reason, the gift to pursue the Holy Word Incarnate by the power of the Logos. You do not realize how much has hung in the balance of your own life because mercy’s flame has been available to you. You have called and God has answered, and through my heart and my hands, mercy has flowed. I say this that you might also have the wisdom to understand that when mercy has been accorded for a time, you are expected to deliver the fruits of mercy, following the works of the LORD and the way of wisdom. The Bodhisattva Kuan Yin is known as the Goddess of Mercy because she ensouls the God-qualities of mercy, compassion and forgiveness. She serves on the Karmic Board as the representative of the seventh ray (violet ray). She also held the office of chohan of the seventh ray for two thousand years until Saint Germain assumed that office in the late 1700s. Kuan Yin ascended thousands of years ago and has taken the vow of the bodhisattva to serve planet Earth until all her evolutions are free. From her etheric retreat, the Temple of Mercy, over Peking (Beijing), China, she ministers to the souls of humanity, teaching them to balance their karma and fulfill their divine plan through loving service to life and application of the violet flame. Kuan Yin’s flame is the color of orchids, the pink of divine love tempering the blue of the will of God. Her flower is a pink and violet lotus; the center, being pink, is as the mercy flame, becoming deeper and deeper violet on the periphery. Pearls of Wisdom, vol. 31, no. 57, September 9, 1984. ↑ Kuan Yin, “The Quality of Mercy for the Regeneration of the Youth of the World,” Pearls of Wisdom, 1982, Book II, pp. 120–21. ↑ Kuan Yin, “A People and a Teaching Whose Time Has Come,” September 18, 1976. ↑ Kuan Yin, “The Sword of Mercy,” October 10, 1969. ↑ Kuan Yin, “Karma, Mercy, and the Law,” Pearls of Wisdom, 1982, Book II, p. 106. ↑ Kuan Yin, “A Mother’s-Eye View of the World,” Pearls of Wisdom, 1982, Book II, p. 87. ↑ Kuan Yin, “Mercy: The Fire that Tries Every Man’s Works,” Pearls of Wisdom, 1982, Book II, p. 95. ↑ Kuan Yin, “Mercy: The Fire that Tries Every Man’s Works,” Pearls of Wisdom, 1982, Book II, p. 96. This page was last modified on 16 March 2019, at 22:51.